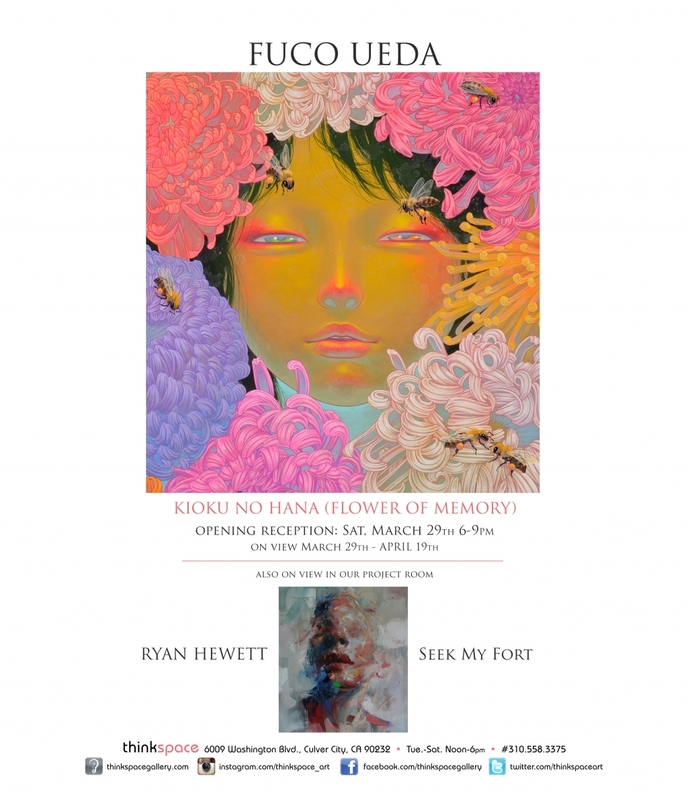 Thinkspace (Los Angeles) – is pleased to present Kioku No Hana (Flower of Memory), featuring new and recent works by Japanese artist Fuco Ueda. 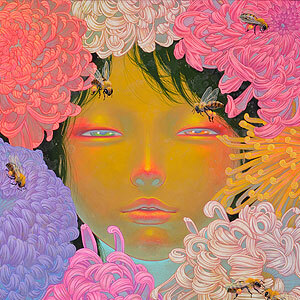 Ueda is renowned for her surreal narrative paintings of slight girls surrounded by all manner of lush hyper-colored flora and fauna. The artist’s work conveys a feeling of ambivalent rapture, as her dreamy subjects are suspended in varying states of silent revelation and resignation; quiet witnesses to recondite mysteries. Drawing from the coexistence of oppositions, the sickly sweetness of Ueda’s imagery is often offset by the inclusion of disturbing or unexpected juxtapositions. Her young girls are frequently staged in secret communion with sea creatures and land beasts, and appear in equal states of threat and calm. Beauty lives and thrives in Ueda’s surreal universe – a place of unlikely kinships and unsettling recesses – as the artist forges a precarious harmony between light and dark, loneliness and friendship, emptiness and largess. Kioku No Hana is the artist’s first solo exhibition with the gallery. This body of work is largely based on the cultural motif of the chrysanthemum flower: a symbol of lamentation and grief in Japanese culture. Ueda draws from the recurrence of this symbol to create beautifully lush tableaux – at once rich and ornate, while also suggestive of absentia and loss. Throughout, Ueda’s illustrative representation of the chrysanthemum is symbolically heightened to a supernatural pitch. While familiar and clearly derived from the recognizable world, her stylized renditions become beautifully excessive and seemingly imbued with a talismanic power beyond our recognition. Ueda creates these highly saturated works with the meticulous application of acrylic washes and mineral pigments on paper, cloth and wood. Delicate, and yet simultaneously forceful and unsettling, the works seem to hover in a dream state of surfeit and exaggeration. Ueda’s technique is distinctly her own, and her palette and imagery are undeniably iconic. In Kioku No Hana the artist weaves a visual imaginary of plentiful loss, as her work deftly hovers somewhere between joy and exquisite sadness.